Uses For pronounced varicose veins, and tired, aching legs. 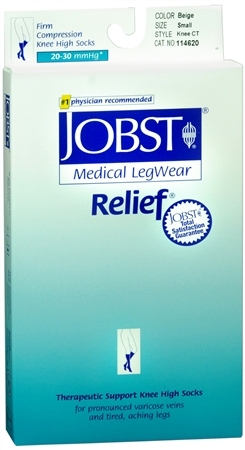 JOBST - the No. 1 physician recommended brand of compression hosiery for over 50 years. Relief provides medically recommended gradient compression to improve blood flow and help prevent swelling. Relief is ideal for patients who prefer: a generous toe area; a wide, smooth band for a comfortable fit that does not slip; a reinforced heel pocket for durability; a soft, smooth texture; hosiery that is easy to put on. Small: b- 7 - 8 1/4 inches (18-21cm), c- 11 - 15 inches (28-38cm).